By purchasing an item from our store, you will help fund research needed to save lives from this devastating disease. All proceeds benefit the Every Breath Counts Foundation, a 501(c)(3) organization, tax ID #20-8964403. Because all bracelets are handmade, each one could vary in size and appearance in photo. Average size: 7 inches. The colored beads on these handmade bracelets represent all of the types of cancer and the millions that battle these devastating diseases daily. 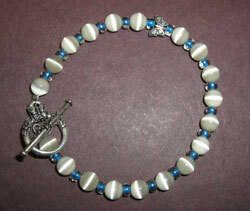 The lung cancer awareness bracelet is primarily white beads with accents of blue. Proceeds from these bracelets go to the Every Breath Counts Foundation and its worthy charities. 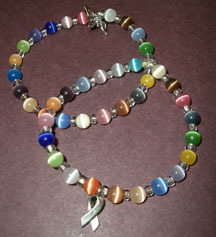 Choices include a wire bracelet with toggle or a stretch bracelet; both types are adorned with either a butterfly charm or cancer ribbon charm. Please note these bracelets are handmade and as such may vary slightly from the photos in size, bead placement and or color. 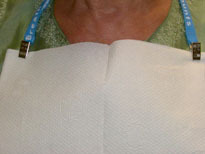 Average bracelet length is about 7″. 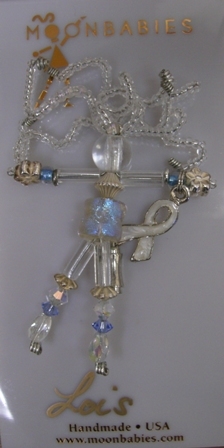 MOONBABIES® are beautiful hand-made beaded products. This lung cancer awarenss pin is one-of a-kind, created specially for the Every Breath Counts Foundation. Proceeds directly support the work of the Foundation. 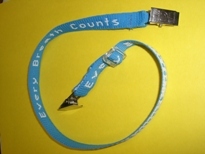 Protect your clothes while you dine with this unique bibkin and show your support for the Every Breath Counts Foundation. 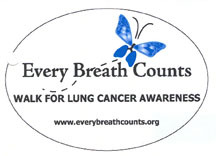 Show your support for the Every Breath Counts Foundation by purchasing, and proudly displaying, this magnet.